56% said they think President Donald Trump had an affair with Stormy Daniels, compared with 9% who said they don’t think he did. 54% percent of Republican voters said they were unsure of whether he had an affair with Daniels. Among all voters, 42% approve of Trump’s job performance, compared with 53% who disapprove. By a roughly 5-to-1 margin, voters believe Donald Trump had an affair with adult film star Stormy Daniels before he became president, according to a new poll that also suggests those figures are doing little to swing public opinion of the commander-in-chief. In a Morning Consult/Politico survey, conducted in the two days immediately following CBS’ March 25 “60 Minutes” interview with Daniels in which she provided new details surrounding the alleged 2006 tryst, 56 percent of respondents said they believe Trump had an affair with the adult film actress, whose real name is Stephanie Clifford. Nine percent disagreed. Thirty-five percent said they were unsure whether the affair happened, driven largely by 54 percent of Republican voters who said they didn’t know or had no opinion. Among all voters, 42 percent approved of Trump’s job performance in the new survey, while 53 percent disapproved — a negative 4 point net swing from the previous week. As a point of comparison, weekly polling shows Trump’s net approval slid 9 percentage points in the immediate aftermath of last year’s deadly protests in Charlottesville, Va. The share of voters who said the Daniels matter did not make much difference either way in their opinion of the president rose to a 46 percent plurality from a 39 percent plurality two weeks ago. The most recent poll was conducted March 26-27 among a national sample of 1,997 registered voters. The survey has a margin of error of plus or minus 2 percentage points. “I don’t think that interview is going to go down as one of the great influential moments in television history,” Syracuse University professor and media scholar Robert J. Thompson said during a Tuesday phone interview. He said Trump’s lewd remarks about women during a 2005 “Access Hollywood” taping, which surfaced on Oct. 7. 2016, were far more significant. Partisans “have formed their sides” and the time for issues of personal morality to swing opinion likely passed during fall 2016, Thompson said. “The way in which we normally expect these things to happen — because of the way they happened before — is not a principle with which we can operate,” he added. While Trump’s approval rating among his self-identified supporters registered a net negative swing of 3 percentage points in the most recent survey, he retained approval from 84 percent of those voters, with 14 percent opposing his job performance in office. 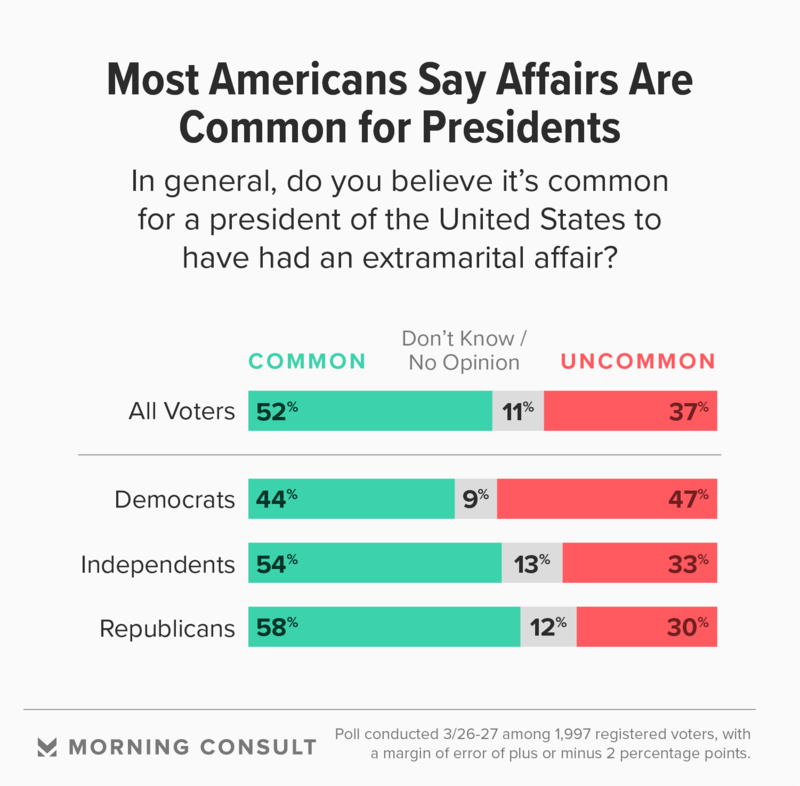 Seventy-six percent of Trump’s supporters said extramarital affairs are morally wrong. Voters overall have never put much stock in Trump’s honesty or morality. An October 2016 survey by Morning Consult/Politico found that 58 percent of respondents said he wasn’t moral, and 52 percent did not find him to be honest. In the new survey, 55 percent said Trump isn’t moral and 53 percent said he isn’t honest. While the “Teflon Don” image of a president impervious to scandal persists, some Democratic strategists are betting that the Daniels attention, along with other unsavory news stories, will ultimately prove problematic for Republicans, particularly in the suburbs, who are running for election or trying to hold their seats in Congress. With Democrats needing a net gain of 24 House seats to win control of the chamber in a midterm cycle that is largely a referendum on the president, at least one Republican strategist agreed that, while the Daniels story might not be “the killer,” Trump’s perceived personal faults could hurt the GOP down-ballot. “It’s just death by 1,000 cuts,” said Liz Mair, founder and president of Mair Strategies LLC who has consulted for candidates such as Wisconsin Gov. Scott Walker (R) and Sen. Rand Paul (R-Ky.), in a Monday phone interview. In a Monday press briefing, deputy press secretary Raj Shah said the president “has consistently denied these underlying claims” regarding the Daniels affair.